3293 San Amadeo D, Laguna Woods, CA 92637 (#OC18046971) :: Ardent Real Estate Group, Inc. ABSOLUTELY GORGEOUS VIEW from this wonderful detached home with a attached single car garage. Beautiful Hardwood Floors and Shutters throughout. This La Princessa is a charmer and spacious 1 Bedroom / 1 bath home. Beautiful Greenbelt Views from every room! You'll enjoy a Peaceful Private Front Patio and a rear Patio overlooking the GORGEOUS VIEW! This home includes Central Heat and Air Conditioning, Energy efficient Double Pane Windows and Doors, all Major Kitchen Appliances and plenty of built-in Storage, Washer/Dryer, Water and basic Cable. Add this to all the amenities offered at this lovely resort-style 55+ Community of Laguna Woods and you have a winning combination-golf, tennis, 7 clubhouses, 5 swimming pools, equestrian center, gardening opportunities, over 200 clubs and organizations ensure you will never get bored here! Country Club Living at its BEST! Laguna Woods is one of the best kept secrets in Orange County! Approximately 6 miles from beautiful Laguna Beach. Free bus transportation. 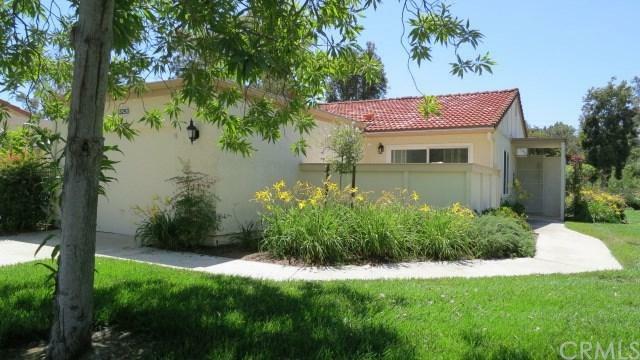 Sold by Catherine Mulley of Laguna Premier Realty Inc.. Listing provided courtesy of Jennifer Heflin of Laguna Premier Realty Inc.